Recently over a few month period we ran into a situation with a few riders that at first was mystifying but we got it all sorted out. These riders were complaining that their horses were getting sore right behind the shoulder area on both sides. So we started from the beginning and had each of them try their molds back on their horse’s backs to check the fit. They all said the EQUImeasure still fit perfectly. The problem in each case was the two point position. The two point position is nothing more than standing in your stirrups with your seat hovering just above the saddle. In this position all of your body weight is in the stirrups. So how could the two point position be the culprit here. After all, jockeys race in the two point position and their horses don’t get sore. The difference here is that a jockey’s race is over in a couple of minutes; an endurance rider’s race is several hours. A saddle by design has the stirrups hung forward of the center point in the saddle. Centered Riding has us with the ankles, hips, shoulder and ears in vertical alignment with the ball of the foot in the center of the stirrup. Their is an offset between the ankle and the ball of the foot so the stirrup has to be forward of the center point of the saddle to accommodate this offset. 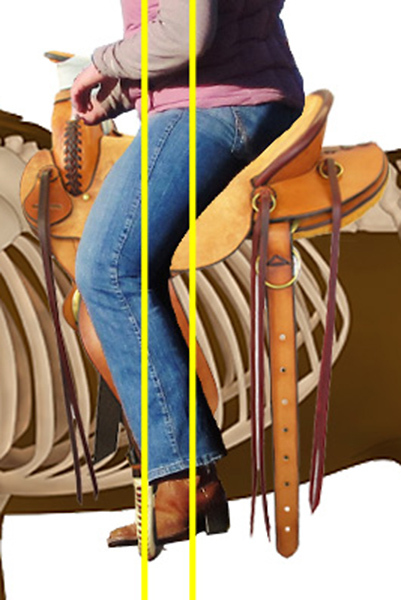 So if you two point all of the time your entire body weight is shifted to the front of the saddle loading pressure right behind the shoulder blades. So what is the solution? Post a trot for a while. Sit a canter for a while. 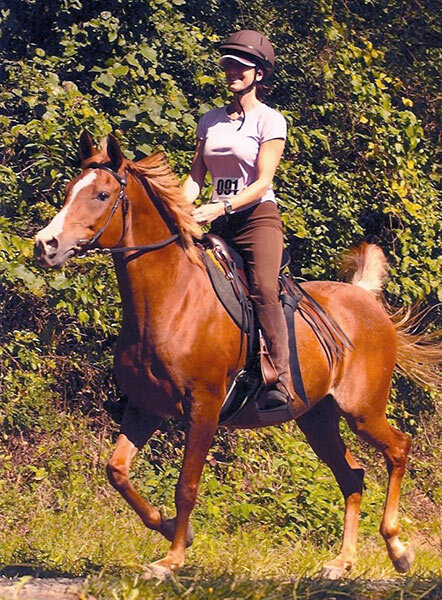 Use a modified two point at the trot by engaging your inner thighs so you can take some weight out of the stirrups. Canter on the left lead. Canter on the right lead. Get off and run a downhill section of the trail once in a while. Post on both diagonals, not the same one every time. Two point a canter for a while. The key here is to use a variety of techniques to allow the horses back to get a break from using just one position. The better distance riders are constantly changing their position to help their horse. When you change what you are doing, the horse uses slightly different muscles in a slightly different manner and gives other muscles a little break from the constant pressure. Better riders also use their hip, knee and ankle joints as shock absorbers to lessen the impact of their weight on the horse’s back. I have always believed that if we are going to ask our horses to do exceptional things than we need to become exceptional riders so we can keep them healthy and performing at their best. Thank you for these articles. We have small trail horses in relationship to our size. We have bungled around with all different techniques but never come up with a long term answer. We found that we can ride for around one hour then we have to get off and walk for 15 to 30 minutes. We thought that it was just us but it was almost relieving to find out that we are not alone. It appears that there are new tree types to match the new riding style. I don’t know if that is good or bad. We equestrians need to be more giving with our knowledge. Maybe you could explain this to us.